The Universitat Autònoma de Barcelona (UAB) wasfounded in 1968. The founders aimed to establish four principles ofautonomy: freedom to select teaching staff, admission available to allstudents, freedom to create its own study plans and freedom toadministrate the University's capital. The Universitat Autònoma de Barcelona (UAB) was founded in 1968. Thefounders aimed to establish four principles of autonomy: freedom to select teaching staff, admission available to all students, freedom to create its own study plans and freedom to administrate the University's capital. It is a young university, but in its short history has moved forward at a rapid pace. The Autonomous University of Barcelona community is made up of 37,000 under graduate students, 6,500 post-graduates, 2,700 teachers and researchers, and 1,200 administrative staff. The UAB's 11 faculties offer a wide range of study and research, including Humanities and Social Sciences, Law, Business Studies, Health Sciences, Experimental Sciences, Art and Design, Technology, and Engineering. While Catalan is the primary language of instruction at UAB, a wide range of subject sare offered in Spanish and English. The Autonomous University of Barcelona is among the best education establishments in Spain and the European Union in terms of the quality of teaching and research. 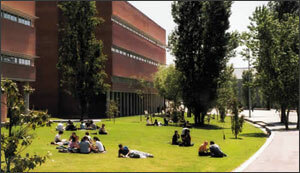 UAB Idiomes (The School of Modern Languages) is an integral part of the University. It specialises in teaching modern languages, including Spanish, to students from around the world,combining the highest standards of university teaching with the latest technology. Its courses are aimed at students from a wide variety of backgrounds and are all taught by highly qualified staff. The Spanish courses are held at the language school which is located right in the heart of the city on the UAB Casa Convalescència campus, an art nouveau building declared a world heritage sight by UNESCO in 1997. The building has a total of 35 classrooms and 4 lecture hallsall equipped with multi-media technology and audiovisual material. There is also a learning room with high-speed Internet connections that students can use free of charge. The courses at the Autonomous University of Barcelona are designed by language experts to suit the specific needs of foreign learners. The flexibility of the programmes allows for a number of different study options. Intensive Spanish courses are ideal for those who wish to learn Spanish in a short period of time, and the comprehensive level range accommodates all learners,from complete beginners to proficient speakers. All Autonomous Barcelona University teachers and professors are professionals with university qualifications and specific training in the subject they teach. They have all been chosenfor their academic and social skills from among the best teachers in Europe. The UAB University in Barcelona combines its commitment to society with a firm policy of openness to the outside world. Therefore, UAB has many exchange programs and connections with universities and other educational centres around the world. Every year the Autonomous University of Barcelona welcomes students of all ages and abilities from Europe, the United States and Asia.